Merchant Princes and the Real Cost of Ebooks. In early June I bought the Merchant Princes trilogy by Charles Stross as ebooks, and finished them this week. The story started at a fairly laid-back pace, perfect for reading in bite-size chunks on the train home. The pace and the pressure gradually increased, though, and I finally read the last half of the third volume at a frantic pace over the past weekend. At the end Stross left his protagonists temporarily safe but with an uncertain future and some incredibly juicy open plot lines to explore further; I'm very happy to hear he is planning a set of sequels. If you're at all into thrillers, science fiction or urban fantasy then you owe it to yourself to pick them up. But I got to thinking about ebook pricing. I got these at full price; about 700-800 yen per volume, typical for books like this whether ebook or paperback. But for most ebooks I've not paid anything like the "full" price, and for quite a few of them I've paid nothing at all. In fact, my 50 ebooks (not counting out of copyright works and the like), a mix of fiction and non-fiction, has cost me about 15000 yen in total, or around 300 yen per book. By comparison, typical fiction paperbacks will go for 500-1500 yen, and non-fiction books can cost multiple times that. How could it all be so cheap? I got my O'Reilly programming books on half-off sales; they have something on sale every day, so you can simply wait until the book you want is on special offer. I've paid about $20 each for two Humble Book Bundles, but they contain about a dozen books each. Most of the other books are free from the publishers or released as Creative Commons by their authors. Publishers know that the biggest obstacle to sales is not price or quality, but simply making readers discover the author in the first place. So they release short stories and early novels for free on the net, or through book bundles for a pittance, hoping that people will try the sample and get hooked on the author. It's rather like a drug dealer at a street corner offering the first sample for free. This approach works, of course. If I hadn't downloaded and read Charles Stross' Accellerando, Scratch Monkey and his Laundry short stories I wouldn't have bought the Laundry novels or his Merchant Princes trilogy either. A few free samples converted me to a fan and a reliable future buyer of his books. But there's a lot of free stuff out there today. Tor Books downloads are here for example and Small Beer press has CC licensed works here1. Feedbooks has a large, though uneven, archive, and Project Gutenberg is the giant of out-of-copyright English literature. Aozora Bunko offers old and free books in Japanese, while Projekt Runeberg scans and digitizes Scandinavian literature. Many authors offer works on their web sites, and a few, such as Cory Doctorow publish all their works under a CC license. This is like having a dozen drug dealers on every street corner pushing more free samples you could ever use into your hand. My available reading time has not increased, and I can only read so much every year. Every free book or book bundle I get uses up reading time that I won't use for a full-priced book. I pay a fraction of the list price for my reading without even trying to, and could probably pay nothing at all were I a real cheapskate. Good for me of course, and no doubt good for many other readers too. I do wonder what impact this de-facto price cut has on the publishing economy though. I suspect the potential impact is rather larger than for libraries. 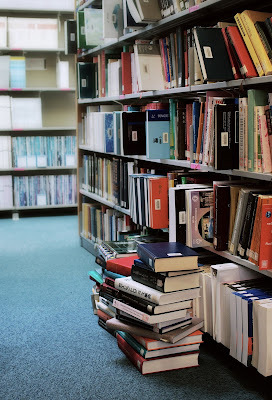 Libraries will of course let you borrow books for free, but they only have one, sometimes two, copies of each book. If twenty people saw my post here and wanted to borrow "Accellerando" at the Osaka municipal library (assuming it's even there at all), they'd have to wait their turn over the next year or so. At least some of them would perhaps end up buying it rather than wait. For a free ebook, on the other hand, all of them can visit that link above and get the book right here and now, no strings attached. Even if the transition to ebooks as the dominant format really happens and goes smoothly, I suspect the publishing world will be in for interesting times. Piracy will be largely irrelevant, and DRM a distraction and net negative for everyone; instead I think it's the publishers own marketing that will have the largest impact on their futures. #1 Try "Stranger Things Happen" and "Magic for Beginners" by Kelly Link. Some of the best short stories I've ever come across; they were a nightly treat when going back home on the train the past winter. Short story collections in general are great for commutes. You can finish a whole story the same day. They're condensed and fast-paced enough to hold your interest no matter how crowded and noisy the train may be. And if a story fails to grab you, you can skip just that one without a guilty feeling that you should finish what you started. We've had an election for the upper house here, and the results where entirely predictable, and fairly muddled. For personal and other reasons I no longer dedicate much time to read and think about Japanese politics; I know this comes as a relief for most of you. In short, the DPJ predictably collapsed; Hashimoto's new party has lost most of its new-face appeal after his blunders; LDP regained much of its former support; and the Communists gained a few seats. All very predictable, almost inevitable, and as a result only about half of all voters actually voted. Many people didn't see much appeal in any candidate, and since the outcome was inevitable anyway there was little point. Tobias Harris has a long, good analysis of the result. The short of it is that LDP didn't manage a majority of their own, so they depend on New Komeito for support. The parties in favour of constitutional reform didn't get a supermajority, so nobody can press through any changes unopposed. And as New Komeito is against removing the pacifist clause among other changes, Abe will have a hard time actually changing the constitution in the direction he wants. Our Man In Abiko has a short take on the election that pretty much sums up my own mood on it as well. People I don't care for won the election, but it's not like there was a credible alternative; and besides the shape of the post-election landscape means it doesn't matter much either way. No, I'm not going to return to regular political posts — don't worry — but I did want to get this off my chest. Three day weekend last week, so we took a rare chance to visit Tokyo and see a ghost story at the new kabuki theater. The story, Yotsuya Kaidan, is a classic from 1825 according to Wikipedia, but the story has been altered many times and remade as films and tv-series over the years, and many modern horror works (such as Ring) take a lot of inspiration from the play and from Oiwa, the main character that turns into a vengeful spirit. Neither I nor Ritsuko really understood the slower first part, but the play really picks up the pace once the first double murder happens. It's a story of murder, betrayal and revenge from beyond the grave, with several substories and peripheral characters. The main character is Oiwa, married to a ronin named Iemon1, who unbeknowst to her murdered her father for refusing to let him marry her. They're very poor, she is sick and weak after giving birth to their son, and Iemon ignores them both in pursuit of money and status. A woman from a wealthier family fancies Iemon and sends Oiwa poison in the guise of medicine; after Oiwa's face melts from the poison and Iemon leaves her she descends into madness and finally accidentally kills herself when trying to go confront her tormentors. Yep, plenty reason enough to become a vengeful ghost. As a yūrei she tricks Iemon into killing his new bride and her father. She then proceeds to torment him in various ways, showing up as a floating corpse in a raft along the river; and when he flees to a mountain retreat she emerges from a burning lantern and torments him with images of their dead child, after which he is finally killed. Good fun overall, in other words. The setting and costumes were more subdued and realistic than in the kabuki plays I've seen so far. It could be a cultural distinction between Tokyo-style and Kyoto-style kabuki; but more likely it's simply a design chosen to fit a ghost story. The new Tokyo kabukiza. Brand new, but in a completely traditional style. 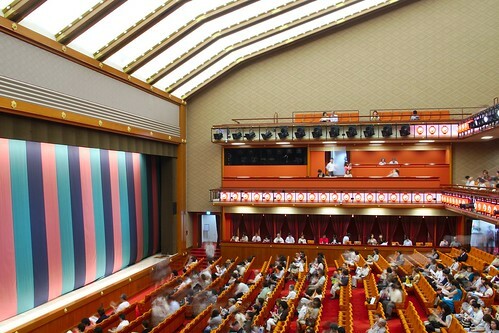 The new kabuki theater itself is beautiful and well designed. The sound is great and you can clearly see everything from any part of the hall. They have monitors for rent that give you the dialogue and a quick explanation of the events on stage (in Japanese); it was helpful, but now and again I found myself missing things on stage while I was busy trying to read the synopsis. 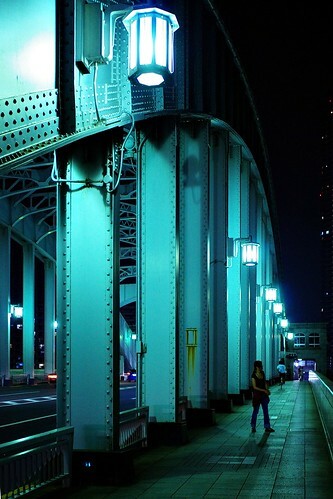 Tsukishima in Tokyo at night. 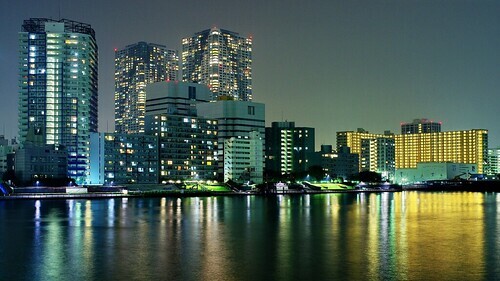 This is south of Ginza and kabukiza, and on the way to our hotel. Tokyo itself was hot and humid. 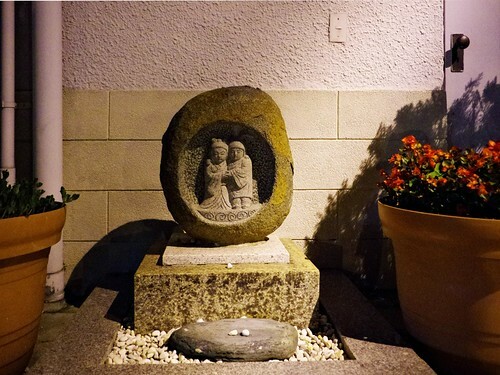 We stayed one night, with the kabuki play in the evening of arrival. The next day Ritsuko went to Ginza while I spent some time in Akihabara searching for a small water pump or a solenoid water valve, but without any luck. It's not really the right kind of place for such parts I guess. A sudden rainstorm hit Tokyo just as we were about to meet up at the station. 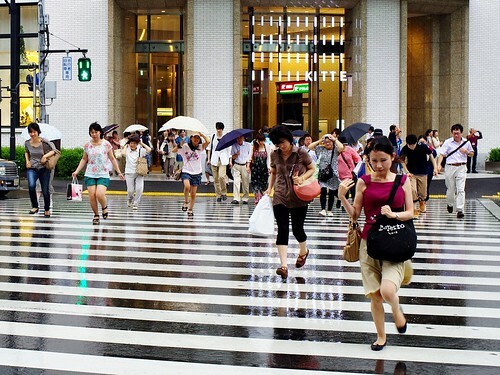 Lots of people were caught in the sudden rain without an umbrella. Moral of the story: always bring an umbrella in Japan. Yes, even when you're sure you won't need it. #1 That's "iemon" with an i, not "Lemon". So, 44 Is It Now? I had my birthday last week. Very neat number, 44; nice and symmetric. And it's just on the cusp to "real" middle age. From next year I'll be closer to 50 than to 30, and can start complaining about kids these days. Looking forward to practice my "grumpy old man" routine. I'm relaxing on our spacious (well..) balcony, wearing my new hat and shirt. In another few hours we're on our way to dinner. We celebrated on Saturday. 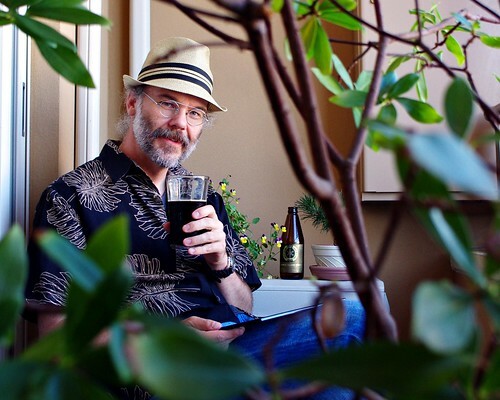 Ritsuko gave me a cool Hawaiian shirt and a summer hat. I've come to appreciate hats ever since my "receding" hairline turned into a disordered rout. The summer sun is strong here, and burning your bald spot is no fun, not to say potentially dangerous. As we usually do for our birthdays, we went to dinner, this time at "Restaurant Hamburg", not too far away from home. 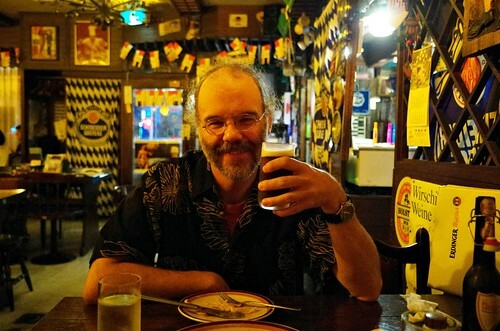 It's a quite authentic-feeling German restaurant in a relaxed pub style. Lots of heavy, meaty foods in other words, but it is quite delicious. The beer list is not large but well selected; I don't get to drink a real Altbier too often. Your humble correspondent enjoying an Altbier at restaurant Hamburg. Unfortunately the authenticity extends to dim, yellowish lighting that gives the place a good ambiance but makes photography difficult. We had soups — my pea soup was delicious; sausage plate; fried pork cutlets with pasta-like dumplings; lamb-chops; and a berry compote with ice cream. A great evening. The restaurant is in the Karahori district, just east of us. The whole area is filled with old single-family buildings, dual-use homes with shop-fronts on the bottom level and small apartment buildings in a maze of narrow streets and alleyways. It's becoming quite fashionable, but retains a quiet, homely vibe to it that I really like. It's close enough that we chose to walk home rather than take the subway. 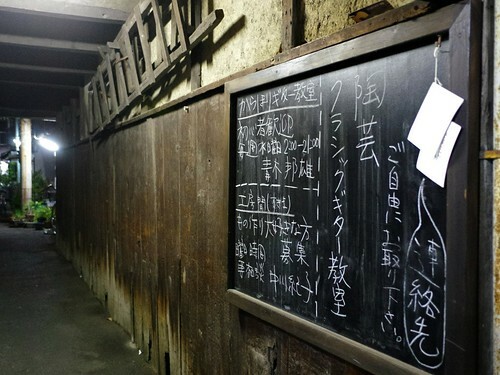 A blackboard advertises "Karahori Guitar School" at the entrance of an alley. Neighbourhood alley entrances like this one sometimes go through the first floor of a street-side building like this, with up to a dozen homes on the other side. 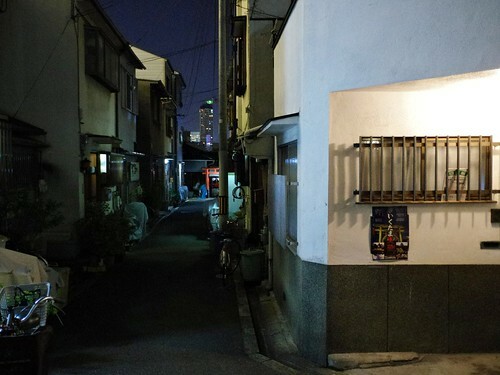 A karahori side street with a shrine at the end.